When I first heard about District 9 (2009), I thought, 'why the hell is this movie so big?' I mean, for a low-budget sci-fi made in South Africa and produced by a New Zealander to go straight to number one at the US box-office is pretty whack, huh? Now, seeing it on DVD, I know what all the fuss was about, District 9 ROCKED! 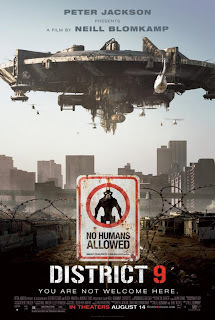 Sci-fi's have never rocked my world, but I don't really see District 9 as a basic sci-fi, I see it more as one of those movies that changes people's point of view. Wikus Van De Merwe (Sharlto Copely) is an amateur sort of guy, who goes out as part of MNU to move aliens that made Johannesburg their home 20 years ago. These aliens, better referred to as prawns, came in a huge mother ship and invaded the slums of South Africa, known as District 9, not allowing any humans to come near them. But when their ways become too much for the humans to handle, MNU go and attempt to move them to District 10. This attempt is not only unsuccessful, but Wikus comes into contact with one of the prawn's belongings, one which eventually turns him into one of them. District 9 is amazing, because it has that 'taking-over-the-world' feel to it. It is also great because the whole cast is unknown, so it doesn't have that made for Hollywood label stuck to it. The way it is made, mostly documentary and home-video style, makes you believe this is really happening, and believe me, I really thought that aliens had taken over South Africa. Scary, action-packed and worthy of your time, District 9 is one of the best movies of 2009 and a definite must-see.